Revolutionary Kickstarter marketing. Get seen by millions. 1500+ Happy Customers And Counting! Q: This is insane, how can you do this? R: We've been working with gadgets for a long time and we've learnt how to attract just the right audience. We believe that quality beats quantity in advertising and we're so confident in our targeting that we're able to guarantee a positive return on investment for some campaigns. When you purchase one of our Kickstarter marketing boxes, you'll notice the biggest effects in the following 10-15 days. However, your entry will be active on our platform forever and you're likely to see constant traffic coming from us. We noticed that cool projects tend to get viral multiple times a year, as different people become aware of them and subsequently start sharing them on social media. Our marketing campaigns start within 48 hours of receiving confirmation of payment from our bank. We understand that timing is key when it comes to Kickstarter projects so we do everything that's in our power to move things forward as fast as possible. Every time we share a cool new Kickstarter project with our audience we generate sales. This is because we're 100% focused on improving the quality of our audience. We are only interested in people who actually buy products and this has a tremendous effect on the success of our promotions. Choose the box that best fits your needs. 1 spot left. Hurry up! 80% of the Kickstarter projects that advertise with us reach their funding goals within a week. An Automatic Watch Collection Made From & Inspired By More Than Half a Century of the Legendary Porsche 911. The folks at Mia Melon have designed a modern wool coat. Their coats are lighter and warmer compared to the average wool coat. They are also windproof and waterproof, with a cozy, warm micro fleece lining inside. Through biometric practices of muscle stimulation electroencephalogram (EEG) testing, the MYOKORE Trainers won out in all categories for workout optimization and with the combined practices of high intensity interval training (HIIT), becomes the most effective fat burning functional trainer program on the market. Some campaigns have a $0 budget. 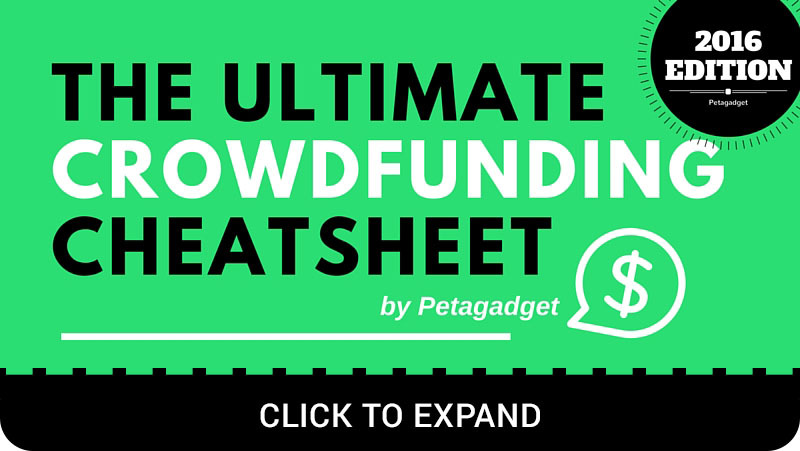 If you're one of them check out our crowdfunding cheatsheet for some free actionable tips to improve your marketing or send us an email at advice@petagadget.com and wel'll do our best to get back to you. How do I submit a product? When will my product get live? Complete the above form with your company's name, the email address you used to make the payment, the imgur link where your product's image is located and the product description. We process new products within 24 hours of getting payment confirmation from our bank. Most promotions are live within 30 hours from the moment the product is submitted. How can you guarantee ROI? How do I get guaranteed ROI? Our audience is so well-targeted that we are able to guarantee a return on investment for certain campaigns. For these campaigns we guarantee sales worth at least the value of the purchased package. If that doesn't happen we pay for the difference (we've never had to do that so far). We only offer guaranteed ROI to the products that we think have a high likelihood of succeeding with our audience. So far we've been able to offer guaranteed ROI on 15% of our Buzz Boxes, 22% of our Launch Boxes and 30% of our Viral Boxes. We're working hard to improve these numbers every month. I have a gif that explains how my product works. Can I submit it? I like how my campaign is performing. Can I upgrade to a larger package? We noticed that gifs tend to increase either positive or negative feedback, as users tend to feel more strongly about them. Therefore we only allow gifs if they are crucial for explaining the product. Each package is designed to maximize performance and ROI. Upgrading to a larger package while a promotion is still active will lead to less than optimal results and for this reason we generally don't allow it. Why don't you allow for direct image uploads? Can I purchase more than one package? For security reasons we cannot allow you to directly push images to our system. Imgur is a safe and easy way to upload images so we prefer working with them. Yes, we allow up to one package a week for each product.